Wash the brown rice and the wild rice together. Add the rice to a large sauce pan with the chicken stock, olive oil and salt and pepper. Bring to boil and cover, lower heat and simmer for 40 to 45 minutes until liquid is evaporated and rice is fluffy. If using a rice cooker follow directions for brown rice. When the rice is done spread it on a sheet pan to cool. Melt the butter in a large skillet until it sizzles. Add the leek, celery and Swiss chard stems and sauté until translucent, about 10 minutes. Add the chopped thyme and sage leaves stirring to release their aroma. Pour in the brandy or white wine to deglaze the pan and reduce by half. If the Grilled ArtiHearts are right out of the refrigerator, microwave them for 10 seconds in the bag, this will make them easy to separate. Add them to the pan, sauté for 2 minutes, then add the swiss chard leaves. Sauté until the leaves are just wilted, about 7 minutes. Spread the mixture on a sheet pan to cool. In a large bowl, mix the rice, Grilled ArtiHeart mixture, chopped parsley, egg and salt & pepper to taste. If the mixture seems dry add a little more chicken stock. Fill a buttered oven proof dish with the stuffing, cover, and bake at 400ᵒF for 20 minutes. Remove the cover and bake 15 more minutes until the top is slightly crunchy. 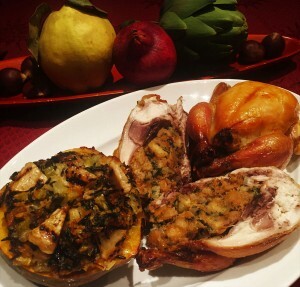 If stuffing a bird, make sure the bird is thoroughly cooked before serving. This stuffing would be great with Cornish Game hen, duck, chicken, and of course turkey. The smokiness of the Grilled ArtiHearts would also work well with a roasted rack of pork. If you want to use a squash as a baking dish choose one that is round and flat like a Cinderella pumpkin. Hallow out the squash and rub the inside with softened butter. Season with salt and pepper and fill the squash with the Artiheart Stuffing. Place on a buttered baking dish, add 1 cup white wine and cover with foil. Bake covered at 350ᵒF for 45 minutes to an hour depending on the size of the squash. Remove the cover and continue baking 30 to 45 minutes, again depending on the size of the squash, until the top is crispy and the squash cooked through. When serving, scoop out squash and stuffing for a delicious accompaniment to any fall meal.